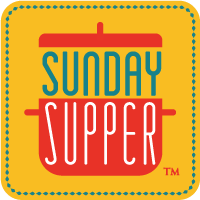 This week, Sunday Supper partnered with Gourmet Garden to share easy Holiday entertaining recipes. We were provided with a wide variety of Gourmet Garden products, including various herbs, garlic, ginger and more. These products are used like fresh herbs in a one-to-one ratio, but can be used in place of dried, typically at a two-to-one ratio. So, two tablespoons Gourmet Garden ginger equals one tablespoon dried ginger. I have been using Gourmet Garden products whenever I can in my every day recipes. First I made Gingerbread Pancakes using Gourmet Garden’s ginger. It was so nice to not have to peel or grate the fresh ginger. I just squeezed out the exact amount I needed and put it back in the refrigerator for next time. Anyway, my family ate so many pancakes, I only had one lonely pancake left for pictures. Needless to say, I will be making them again (saving more for pictures this time) and will share the recipe soon! Next I was inspired by my Garden Pizza Puffs recipe. I frequently make vegetable pizza puffs with spinach, broccoli and/or mushrooms. This time I decided to go with something simple – Garlic and Herb Pizza Puffs. I mean, you really can’t go wrong with fresh garlic, herbs and cheese, right? I used Gourmet Garden’s garlic paste and Italian herbs in this recipe. It was so nice and easy to have fresh, chopped herbs and garlic at the squeeze of a tube. Garlic and Herb Pizza Puffs are delicious as-is, but they are also perfect dipped in your favorite pizza sauce. Because I am usually making these pizza puffs on the fly, I like to have a jarred sauce on hand at all times. Another one of my kitchen secrets is to freshen a jarred sauce with some fresh basil. I like to start with about 1 tablespoon basil to 1 cup of sauce and then adjust to taste. I used Gourmet Garden’s basil, and having the fresh chopped basil at the squeeze of a tube really makes it easy to adjust the amounts to perfection. You can find Gourmet Garden products at your grocery store in the fresh produce section near the fresh herbs. To learn more, visit Gourmet Garden’s website and sign up for their newsletter and download a coupon! Gourmet Garden can also be found on Twitter, Facebook and Pinterest. Preheat oven to 375F degrees. Spray 18 cups in mini-muffin tin with cooking spray and set aside. (I have 2 12-cup mini muffin tins, so just fill the 6 empty cups with water before baking). In a large bowl, whisk flour and baking powder. Add milk and egg, whisking until combined. Fold in mozzarella cheese, garlic, herbs and spinach, gently mixing until combined. Let sit for 10 minutes. Meanwhile combine sauce and basil to make the dipping sauce. Adjust amounts as desired. Divide batter evenly among prepared muffin tin(s). Sprinkle tops with Parmesan cheese. Bake for 20 to 25 minutes, or until puffed and golden. Let cool in pan for 5 minutes. Remove from pan and serve with sauce for dipping. Creamy Pasta with Spinach, Chili, and Walnuts by Healthy. Delicious. You can Pin these recipes from our Easy Holiday Entertaining Pinterest Board. This post is sponsored by Gourmet Garden Herbs & Spices. All opinions are my own. I just bought a mini-muffin tin and this is the recipe I am making to break it in. Fabulous!! Oh my goodness, these are just fabulous!!! They must make their way onto this year’s holiday table! We are pizza fanatics at our house…I could easily sneak one of these for breakfast right now! They look adorably delicious! These look terrific! Everyone loves little pizza bites. Oh, yeah….I could devour these babies!! Your puffs are irresistible!! These little puffs are perfect! I think I am going to make these for my Husband. I know he would just LOVE them!! Well I would too!! Love the recipe! Oh my gosh, these are so much fun. The kids would adore them…and so would I! Making soon.